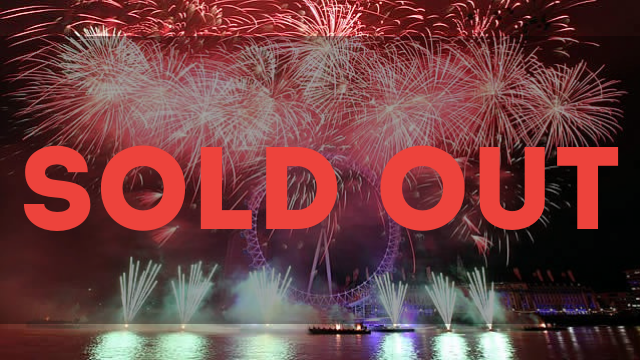 Our New Years Eve Party is now sold out. This exclusive event is a bucket lister. If you are interested in booking for NYE 2019 we strongly advise to book early. The MV Royalty hosts one of the most popular things to do to welcome in the new year on the River Thames with its Firework Cruise London. There is no better place to be than hearing the resounding chimes of Big Ben live and direct whilst getting up close and personal with London’s fabulous light spectacular over the Southbank. Boarding at 8.15pm you will be welcomed on board with a chilled glass of Prosecco by our friendly staff. Once underway, a hot fork buffet of Artisan Chilli will be served. You can then dance the night away whilst enjoying unlimited beer, wine and soft drinks from our fully stocked bar. The Royalty boasts large, bright and airy windows throughout the top deck to ensure the best views. We also have both an open front and back deck and if you prefer to sit and watch the fireworks in comfort, our lower saloon will be the place for you. As we travel up and down the Thames you will take in the ever-changing views along the banks of the river and dance the night away with hits past to present. At 11.30 we will moor up in plenty of time and in prime position to watch the fireworks display. NB: Spirits and champagne available to purchase at pub prices. In addition, we also offer you the facility to book your tickets now and secure your place with a deposit of £40.00 per ticket and pay the balance at the end of October – give us a call on 020 8306 5333 to book today. Don’t take our word for it, read what our past guests have said here.